Networking with other members of the voiceover community should come as naturally to you as breathing, whether the people you’re meeting are other VO talent, casting, writers, game designers, studio engineers or whatever. But for some of you, the lack of something brief yet potent to say to a stranger makes us stop dead in our tracks. What you need is something memorable and appropriate to open that dialogue. You need to present yourself with a hook. You need a talking point. Say you’re at one of my VO classes. And we have a special guest who’s a casting director for a major animation studio. You just did your animation demo with Trevor, and you want to get a moment to connect with that CD. And you want that moment to count. Here’s what I do. I wait patiently if there’s a line, resisting the urge to jump in to the conversation already in progress with another attendee. What are MOO Cards? They’re about half the size of a regular business card, and in the case of Moo Cards, less is more – and boy, do they create a talking point, as your new friend asks about the different images. 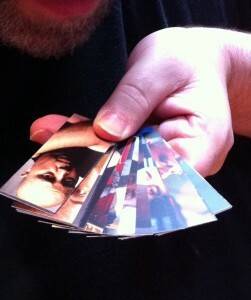 See, the great thing about MOO Cards is the option to have different pictures on each card within each set of 100 cards. Up to 100 different pictures, actually. I add new pictures to my MOO Card set whenever I shoot a new episode of a show, add a headshot or do stage or VO work – I’ll take a still while I’m there. I only have 32 different pictures in my set, so I get 3 of most and 4 of a few in my set of 100 when I reorder. 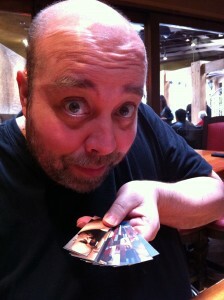 Once you’ve broken the ice with your offer of a MOO Card, it’s a heck of a lot easier to continue with the conversation. And you’re a performer. This is a great opportunity for a nice, calm, professional, brief performance. Give the next person in line their shot at networking. Here’s where you can find Moo Cards: https://www.vo2gogo.com/get-moocards – enjoy. The Pin. The Avail. The Hold. Thank you David for your wisdom. I love moo.com. I get great compliments. Thanks to you, I know how to make a conversation short and sweet. Stupendous (use that word somewhere today!!) idea, David! As always, many thanks for your ideas! Congratulations! Did everyone see David on The People vs O.j. Simpson last night?! Loved it!